I bought a pound of sweet sausage intending to make biscuits and gravy. Only then it dawned on me that there are only two of us. And a POUND of sausage gravy was, perhaps, a bit much. Especially since my husband does not really understand the whole biscuits and gravy phenomenon. Which is why I was very happy to run across this recipe. I tweaked it to suit what we had in the house, and came up with a wonderful winter meal. 1. Soup is another of those things that I grew up thinking of as "hard" to cook. This recipe puts the lie to that idea. This is a 30-45 minute dinner depending on how quick you are at prep work. 2. It is also absolutely delicious. 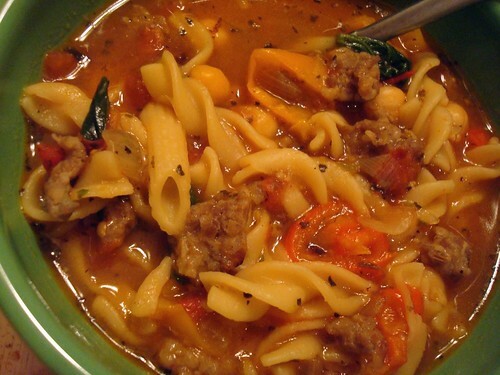 I tend to prefer stews to soups, but all the chunky vegetables, pasta, and sausage make this a very satisfying soup. 3. My husband salted his to taste at the table, but I thought it was just right. 4. We served this with beer bread. Yum!